Indeed, there are some conflicts between the thoughts that jewelry is only worn for social status while some say jewelry comes in living style. But in case of women jewelry makes women feel special and loved. They feel proud owing a great piece of gold jewelry. There were the days when women liked to wear heavy and core jewelry. But with time preference of women has changed and now a day’s different types of beads and other jewelry items are available in the market which can be used to make fascinating jewelry. 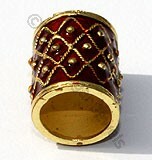 The widest category of these gold items that can be used to make the best jewelry is enamel gold beads. 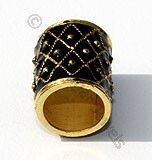 These gold beads are available in 75.6 percent of purity with different shapes and sizes. With these handmade enamel beads or other materials you can make the jewelry even more personal or the kind that suits your tastes. The reason why these beads are the choice of a great number of people is because they require very little maintenance and it is very simple to take care of these products. 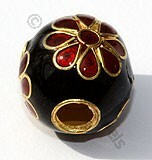 Handmade solid genuine 18k Gold Beads and findings for designer gemstone jewelry making are available in 75.6 percent of purity and yellow in color, Round Black Color with Red Flower Enamel Beads. 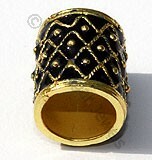 Handmade solid genuine 18k Gold Beads and findings for designer gemstone jewelry making are available in 75.6 percent of purity and yellow in color, Cylindrical Designer Black Enamel Beads. 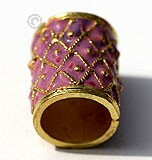 Handmade solid genuine 18k Gold Beads and findings for designer gemstone jewelry making are available in 75.6 percent of purity and yellow in color, Cylindrical Designer Pink Enamel Beads. Handmade solid genuine 18k Gold Beads and findings for designer gemstone jewelry making are available in 75.6 percent of purity and yellow in color, Cylindrical Designer Red Enamel Beads. Handmade solid genuine 18k Gold Beads and findings for designer gemstone jewelry making are available in 75.6 percent of purity and yellow in color, Cylindrical Designer Blue Enamel Beads.